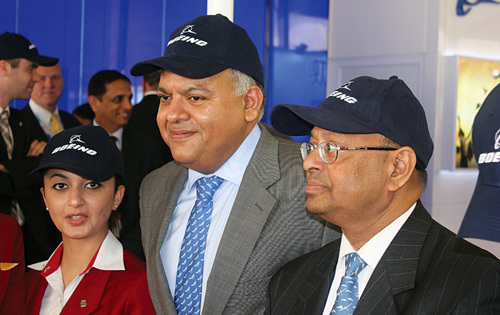 The fourth India Aviation 2014 got off to a spectacular start with Boeing-Spicejet formalising an order for 42 Boeing 737 Max 8 worth US $4.4 billion. Otherwise the inaugural function was marked with speeches indicating the enormous potential of the aviation industry and how the government was trying to address these challenges. The Minister for Civil Aviation, Ajit Singh reiterated India’s move towards becoming the third largest aviation market by 2020, from its present ranking of 9th largest. Indian aviation handled 121 million domestic and 41 million international passengers with over 85 international airlines operating to India and five Indian carriers connecting to 40 countries. Indian airports are poised to handle 336 million domestic and 85 million international passengers by 2020 and the commercial fleet size is expected to grow from 400 to 1,000 aircraft by 2020. He said that the government had envisaged an investment of $12.1 billion in the airports sector during 12th Plan period, of which $9.3 billion would come from the private sector for construction of new airports, expansion, and modernisation of existing airports and development of low cost airports. Growth in airports and air traffic capacity, he said, had to be accompanied by growth in skilled manpower. The government was setting up a separate civil aviation university. The Secretary of Ministry of Civil Aviation, Ashok Lavasa, said that India had made tremendous strides in aviation as passenger and cargo throughput registered an impressive compounded annual growth rate of 13 per cent and 10 per cent respectively during 2003-13. The passenger handling capacity of airports in India has risen from 72 million to 233 million in the last five years. He said the civil aviation industry is experiencing a new era of expansion driven by factors such as low cost carriers, modern airports, FDI, information technology interventions, regional connectivity etc. This surge has fuelled the demand for support services like ground handling, maintenance, repair and overhaul etc. The overall air traffic is expected to grow at an annual average growth rate of 10.1 per cent in this decade. Domestic traffic is expected to grow at 11.4 per cent and international traffic is expected to grow at 9.5 per cent for the next 10 years. In addition to the Greenfield airports at Navi Mumbai, Goa, Kannur and Kushinagar, the Airports Authority of India has identified six airports for private management under the PPP route. The Governor of Andhra Pradesh, E.S.L. 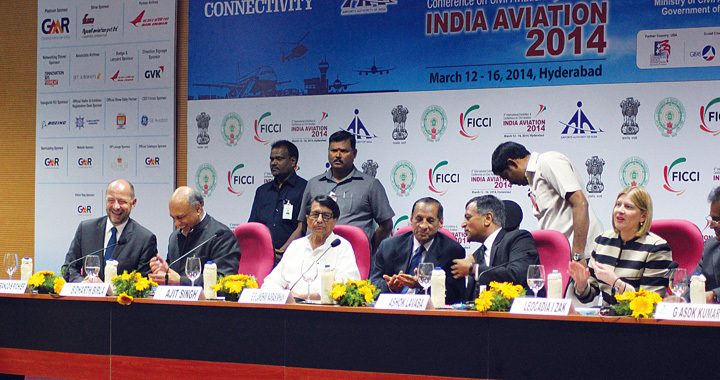 Narasimhan said that the civil aviation sector was presently going through multiple headwinds. However, the sector had nearly $80-90 billion opportunity, but what was required was positive liberal environment. The Ambassador of France, Francois Richier talked about the vibrant aerospace and defence industry in France and how the two countries could partner in civil and military aviation. The Director of US Trade and Development Agency, Leocadia Zak said the US-India Aviation Cooperation Programme (ACP) launched seven years ago exemplified the growing relationship between the two countries. A road-map for future collaboration in the sector was created and two contracts in the airport sector were progressing in the right direction. In his welcome address, the President of the FICCI, Sidharth Birla called for major policy changes in the aviation sector, particularly to do with taxation and aviation turbine fuel which is 60 per cent higher in prices compared to international markets. He suggested creation of an essential air services fund and infrastructure bonds.